Alsace offers charming wines of great quality and unmatched diversity. In the medieval Alsatian villages with their narrow, cobblestone alleys you will meet dedicated producers on terroirs tended by their forefathers since generations. Vintage 2012 gave many good wines. The wines are not as powerful as in 2009 and 2011, not as tart as in 2010. Instead, it's a classic vintage, without too much alcohol and with good balance. "Gastronomic Wines" is a good label, to the extent you need any. But the vintage is a bit uneven, and you should be especially careful when choosing your Gewurztraminer. Pinot Gris and Pinot Noir are consistently successful and 2012 Riesling from the best vineyards can be trusted. 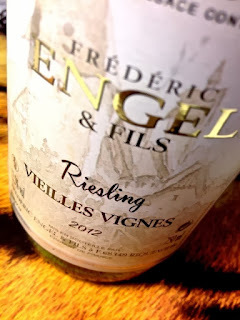 2012 Riesling Vielles Vignes from Frédéric Engel in Riquewihr has a beautiful straw yellow color. The scent is very fresh with classic tones of yellow apples, honey and grapefruit. The palate is medium-bodied and dry, with a nice balance between the youthful fruit and clean acidity. The aftertaste has a typical and marked note of grapefruit peel. A reprsentative, well-made an cheap wine. Price € 6.90. I am a Swedish lover of Alsace, its' wines, villages and people. I have no affiliation to the wine trade and I present my views without bias.